Sarah Bakker, graduate student in anthropology, delivers her paper on the Syriac Orthodox Christian community in the Netherlands, refugees from the Middle East. The prize was presented at the American Anthropological Association's annual meeting in New Orleans. 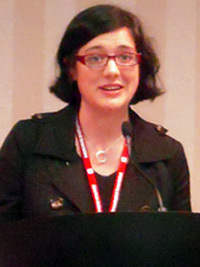 Bakker was awarded the opportunity to present a research paper and have it reviewed by scholars in her field. Bakker is a Ph.D. candidate studying the Syriac Orthodox Christian community in the Netherlands, refugees from the Middle East who have fled violent conflict in their native countries. The community numbers between 10,000 to15,000. Its members have moved to the Netherlands since the 1960s from Turkey, Syria, Lebanon, Iraq, and Iran. They speak a dialect of Aramaic. They face debates on secularism and tradition. "I'm looking at how they try to craft a sense of communal identity in the Netherlands," said Bakker who returned last November from a year of field work. "It is difficult for this community to be a coherent group." Bakker, whose heritage is Dutch and American, grew up in the Netherlands, Alaska, and Seattle. She enrolled at UC Santa Cruz in the fall of 2006 and previously earned her bachelor's degree in classical studies and English at Kings College, London. "I've always been interested in Christianity in its more unusual forms," she said. Her senior thesis at Kings College was on the early Christian church in the late Roman Empire. "I had had an interdisciplinary interest, philosophy, theater, arts, a broad approach focused on ancient Christian history," she said. She discovered anthropology after taking a class while working at the University of Washington several years ago. "I immediately felt at home, felt like I was an anthropologist all this time, " she said. She selected UC Santa Cruz, where she works with Professor Melissa Caldwell, "because of the quality work of the faculty," she said. "I feel shaped by Santa Cruz but not limited by it," she said. "It is so inspiring, really creative, innovative, and very nurturing to my work." This quarter Bakker is teaching a class on the ethnography of Europe. Caldwell said Bakker has won major grants in support of her research including the Social Science Research Council's International Dissertation Research Fellowship and the Wenner-Gren Foundation's Dissertation Research Fellowship for anthropological research.